LOS ANGELES (AP) In a matchup of injury-riddled teams, the Utah Jazz had more depth and made it matter. It was the fourth consecutive victory for the Jazz, who were without four injured players – including starting center Rudy Gobert and leading scorer Rodney Hood. ”I think we’re just scratching the surface with how good we can be,” said Jonas Jerebko, who added 14 points. ”Lou and Austin were gassed a little bit and it’s tough when they had the ball the entire time,” coach Doc Rivers said. Clippers: Los Angeles’ injury situation is even worse. The Clippers are missing starters Blake Griffin (MCL sprain), Patrick Beverley (knee surgery), Danilo Gallinari (sprained ankle) and Milos Teodosic (plantar fascia). ”Everybody just needs to do their job, play their role. The games won’t be 30-30, I guarantee you. Someone’s going to make some shots,” Rivers said. 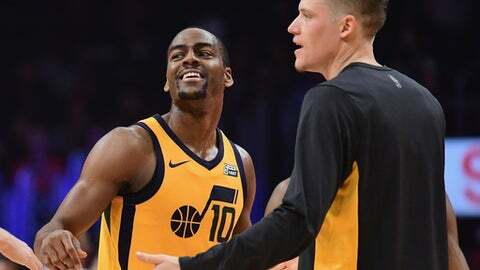 ”We came out in the second half and played with a lot more energy, especially on the defensive end,” said Derrick Favors, who had 12 points and 12 rebounds.